In short, there is a prevailing sense that we are simply not as safe, financially speaking, as we used to be. The productive capacity of the economy may appear largely intact, but the perceived risk is significantly higher…The slow cure for this problem is to allow asset prices, along with perceived wealth and trust, to return to or exceed the previous levels over time… But the process would be cumbersome, partly because trust is more easily destroyed than restored. Others, like David Andolfatto and Stephen Williamson have put forth related arguments, claiming that the crisis has made the “limited commitment” problem more pronounced and reduced the financial systems ability to produced enough safe assets. In these stories, there have been real shocks to financial intermediation. The economy has slowed down, then, because of negative shocks to aggregate supply. And to the extent these shocks are long-lasting or permanent, there is nothing monetary policy can do since the real side of the economy has shrunk. It is not surprising, then, that Tyler, David, Stephen, and others who hold this view are often skeptical of Fed policies to stimulate the economy. While I can accept that there has been some real shocks to financial intermediation, I do not see these disruptions as necessarily being permanent or unamenable to monetary policy for two reasons. First, a case can be made that the risk premium in the short run can be subject to swings not tied to long-run economic fundamentals. For example, the public might become overly-optimistic during a boom and overly-pessimistic during a bust. If left unchecked, these mood-swings might create self-fulling outcomes that last some time as shown in Roger Farmer’s work. In other words, what may appear to be a permanent rise in the risk premium might actually be one of many suboptimal equilibria that could be avoided with the appropriate change in economic expectations by the public. The figure below suggests we are in such situation now. It shows the spread between the yield on Moody’s BAA bonds and 10-year treasury, one measure of the risk premium. It also shows that unlike in other post-recession periods, this risk premium remains about 100 basis points above its historical average with no sign of declining. The safe market rate of interest is now too low, relative to where it should, or could, be. The second reason I think these real financial shocks are not permanent and are amenable to monetary policy is that they ultimately matter because they create a shortage of safe assets. This problem, as I noted before, effectively amounts to an excess money demand problem once one properly accounts for all money assets. Monetary policy is very capable of addressing this excess money demand problem by better managing expectations of future nominal income growth. In particular, an ambitious NGDP level target that significantly raised expected nominal income growth should both reduce the excess demand for safe assets (because of greater nominal income certainty going forward) while at the same time catalyze financial firms into making more safe assets (because of the improved economic outlook). It should also provide the jolt needed to move the economy out of the bad equilibria. For example, imagine how the public would respond if the Fed suddenly announced Scott Sumner’s recent proposal of raising their asset purchase amounts by 20% per month until some NGDP level target was hit. That would be the monetary policy equivalent of shock and awe. Some evidence supporting this view can be seen in the figures below. 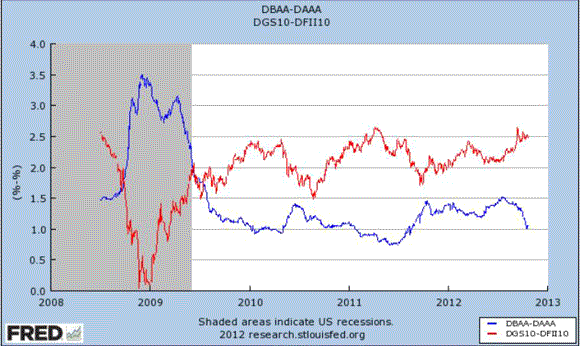 They show two versions of the risk premium plotted against expected inflation from treasuries. This measure of expected inflation has been highly correlated with stock market movements since the crisis began in 2008. One way to explains this relationship is that the expected inflation series since 2008 can be seen as indicator of future nominal spending and by implication, future real economic activity given nominal rigidities (See David Glasner). It makes sense then to use it as a way to asses whether changes in economic expectations are systematically related to changes in the risk premium over this same time. Are risk premiums being drive by changes in the public’s economic outlook? As a robustness check, the following figure plots the spread between the Moody’s BAA and AAA yields against the same expected inflation series. 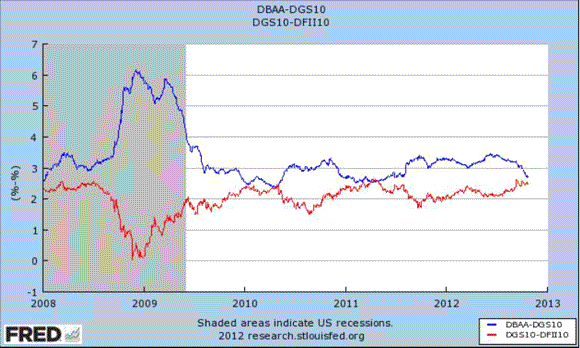 Similarly strong results that indicate that an improved economic outlook drives down the spread. Given these relationships, it stands to reason that the explicit adoption of an aggressive NGDP level target would go a long ways in returning the risk premium back to its long-run value. 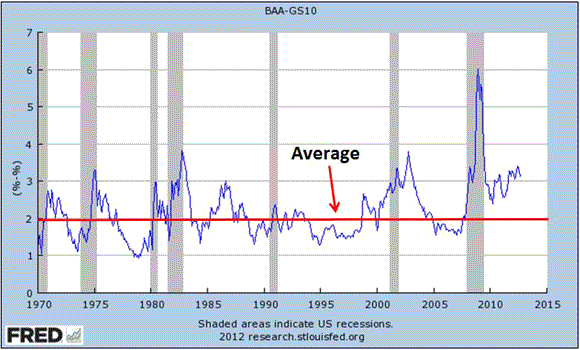 In the figure above that would mean returning the BAA – 10 year treasury spread to about its 2% historical average. This is just another reason why monetary policy can still pack a meaningful punch. 1This understanding also implies Stephen Williamson might be a lot closer to Mark Thoma’s views on the output gap than he realizes.